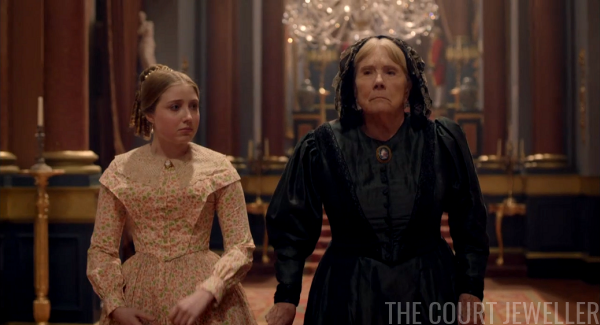 Time for our second Victoria recap of the season! If you need to catch up on the first half of the season premiere (or any other episodes), you can check out all of my previous posts on the show. 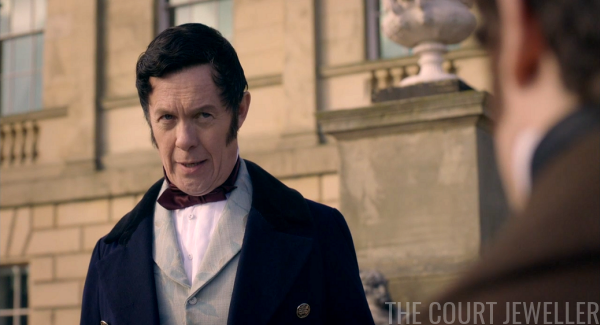 After Vicky's christening, the Coburgs are still skulking about the palace. Ernst Sr. badgers Albert for more money to take care of his home back in Germany, while Uncle Leopold creeps about as Victoria works, reminding her that she needs to produce a son. 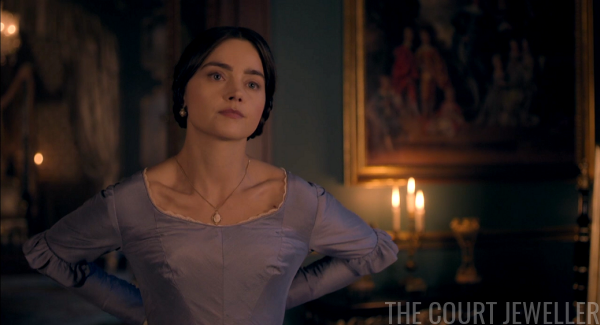 Victoria, wearing a delicate earring-necklace suite set with blue gems, does not need to be reminded. 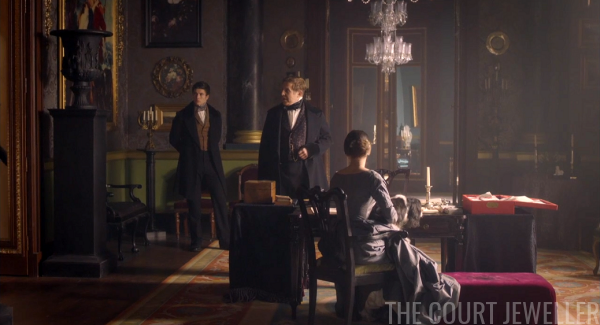 Back at the palace, Victoria and Peel discuss political issues in the Holy Land. 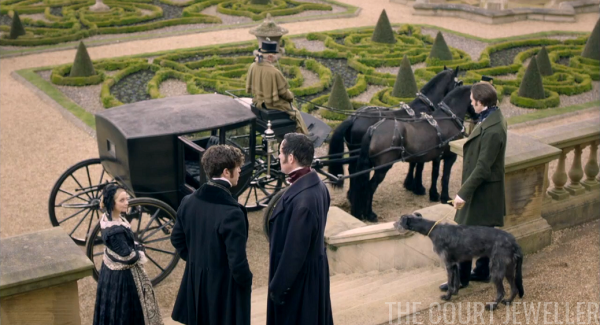 Albert arrives, excited about his meeting with Lovelace. 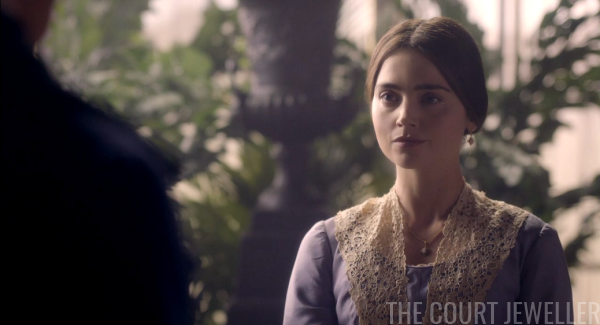 Victoria proposes that they should throw a party and meet some of these scientific minds. 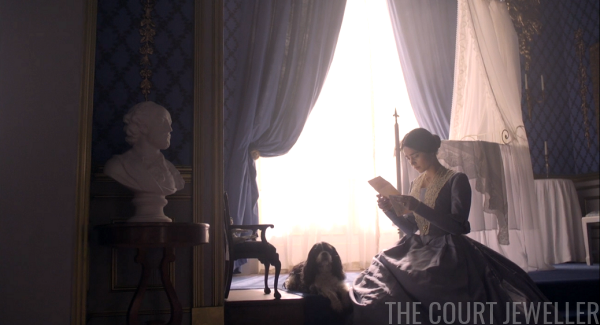 Invitations go out for the cultural reception, and Victoria writes to Lord Melbourne, summoning him for the evening. You know what that means: RUFUS RETURNS. Emma Portman, wearing seed pearls, is surprised and pleased to see her old pal Melbourne arriving at the reception. 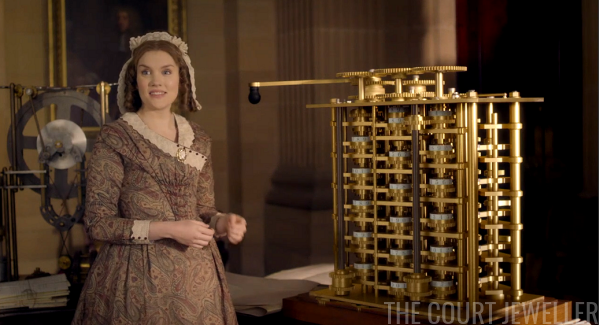 Victoria, who wears her dark purple brooch, is introduced to Ada Lovelace and Charles Babbage. She remarks that she's never met a lady mathematician before. Ada replies that she's never met another one, either. Lord M is the subject of much discussion at the reception. 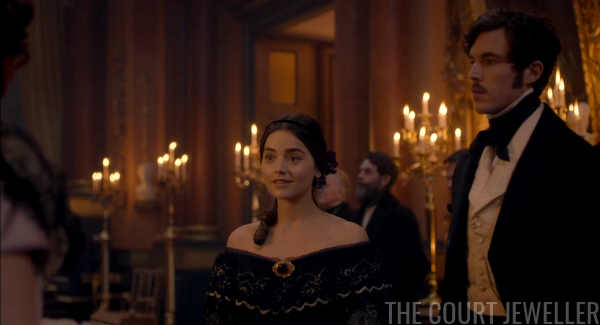 Victoria is thrilled to see him again. Albert gives him study tips. Uncle Leopold sniffs in his general direction. 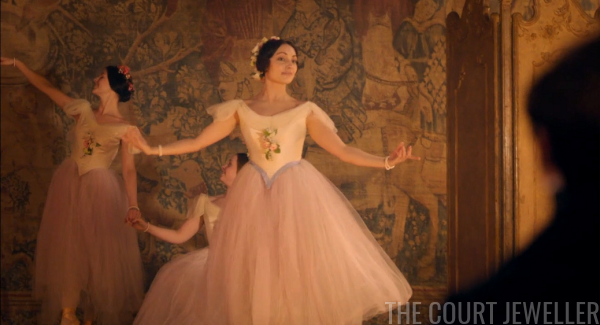 The entertainment at the reception is provided by a famous Victorian ballet dancer, Marie Taglioni. The real Marie, who is said to have been the first ballerina to dance en pointe, was still performing in 1841; she would retire six years later. 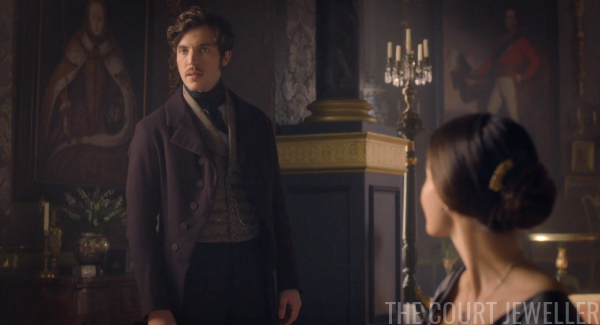 Lord M breaks the news to Victoria that Byron was Ada's father, and she is very intrigued. The entertainment continues with a performance from Othello by the famous American Shakespearean actor Ira Aldridge. 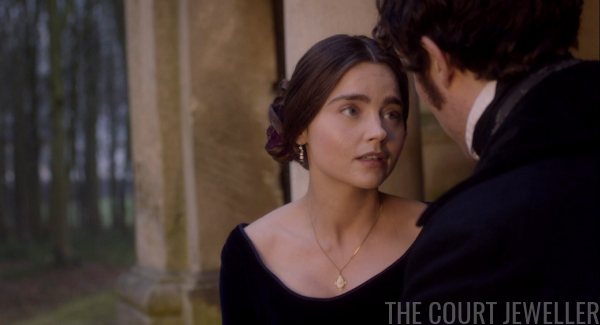 This later gives Lord M the opportunity to talk to Victoria about the "green-eyed monster" of jealousy. Ernst doesn't notice. 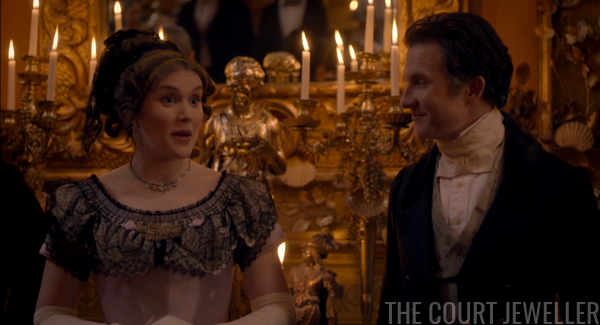 He's watching the performance with his Aunt Victoire, who has rediscovered her tiara-comb-thing in her jewelry box. Later, Charlotte clutches her metaphorical pearls about a black man playing Othello. 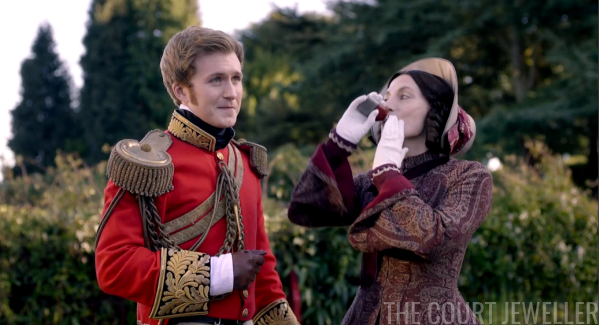 Peel, who looks as if he'd rather be literally anywhere else, reminds her that the part was written that way. 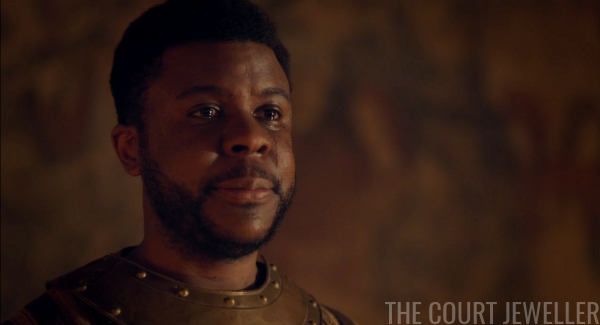 He's clearly regretting putting Charlotte on the list of acceptable ladies for the Queen. And then Victoria embarrasses herself a little in front of Albert, Ada, and Babbage by not understanding math. She's a little jealous of Albert's easy, intellectual conversations with them. Leopold is jealous of Melbourne. Wilhelmina is jealous of anyone who looks at Ernst. Lots of green-eyed monsters in the palace. Day dawns, and surprise! 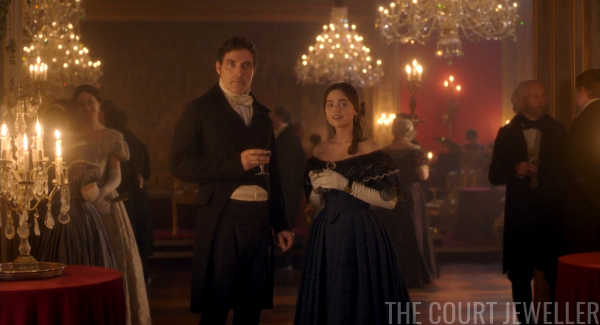 Victoria's pregnant. She has a shocked mirror-reflection moment straight out of The Crown. 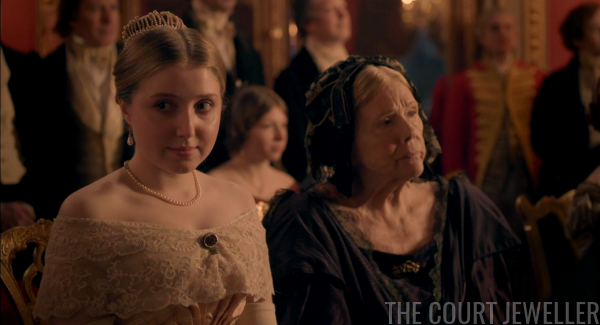 She wears delicate jewels later in the day as she and Albert discuss conditions for children working in mines. (The Royal Commission of Inquiry into Children's Employment's report was issued in 1842.) They argue over whether Lord Melbourne and his party would have made time to investigate the problem. 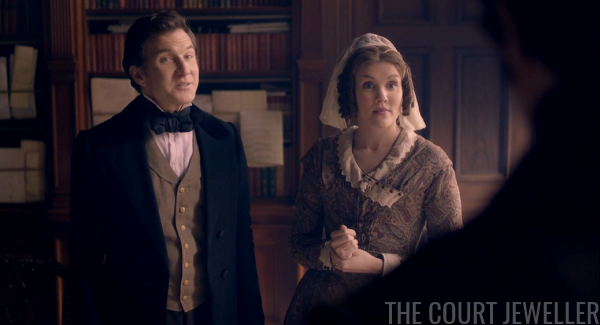 She accuses Albert of being jealous of Lord M; he says he believes it's inappropriate for Victoria to invite him to the palace now that he's no longer PM. 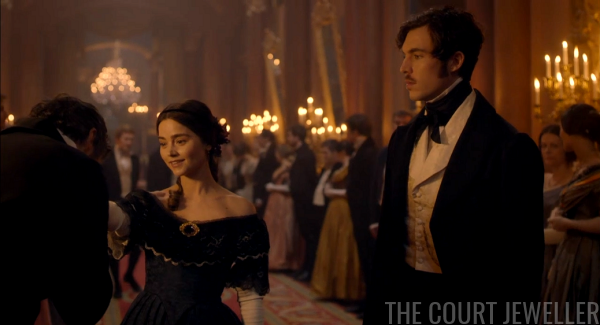 We also see the brooch pinned at the waist of Victoria's dress as she and Albert bicker over his scheduled dinner with the Statistical Society. 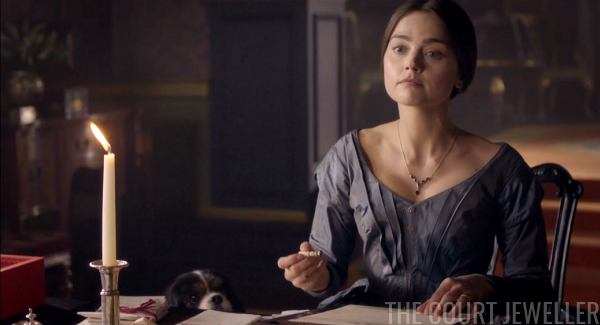 She's jealous of Ada Lovelace, and she doesn't want him to go to the dinner. He goes anyway. 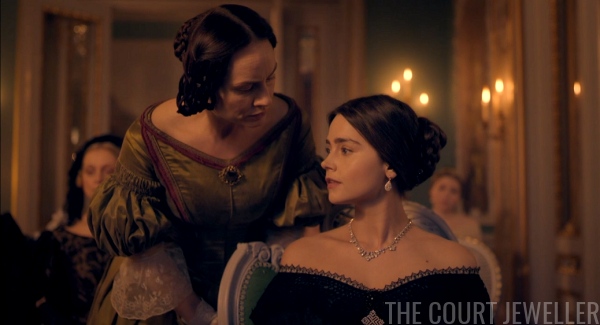 Victoria cries to Lehzen about her pregnancy -- she feels as if she's going "to prison." 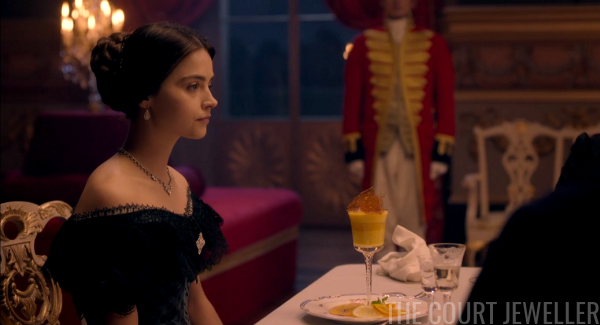 She sends for Albert, asking him to come back to the palace, but he refuses to leave the dinner. She sends for him again, but once more he resists. When Albert does come home, he finds the door to his wife's bedroom locked. 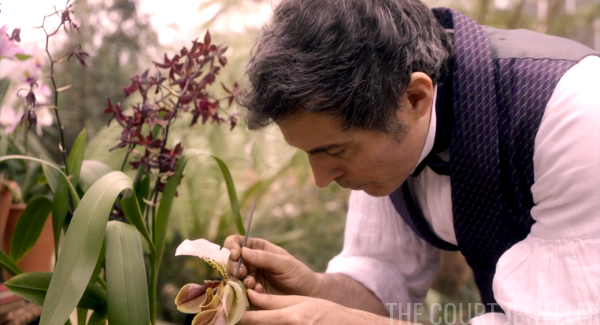 At Brocket Hall, Melbourne is tending to his orchids. 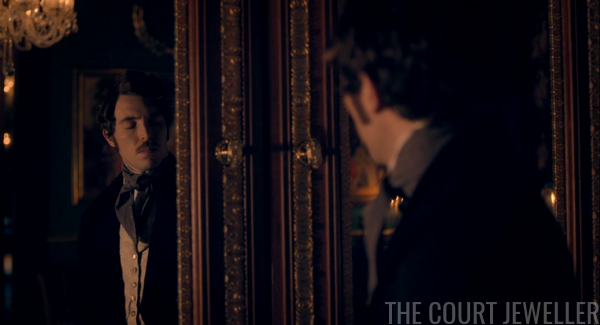 Victoria finds him in his greenhouse, and he shows off the unusual plants in his collection, including a Venus Flytrap. She really wants his advice on marriage, though, which is hilarious given his own track record. 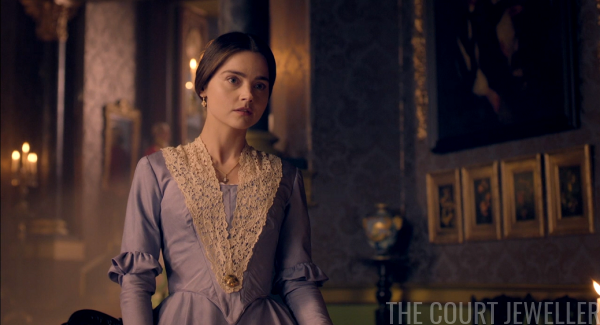 She doesn't know how to be both a ruler and a proper Victorian wife. Her proper Victorian husband is busy again with his own pursuits, talking once more with Babbage and Lovelace about their analytical engine. 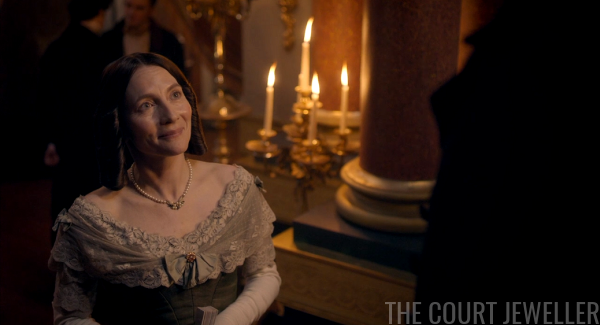 Ada, wearing a fashionable cameo brooch, reveals that sometimes the answers to her theoretical questions come to her in her dreams. Babbage thinks that's silly, but Albert says he sort of gets it. 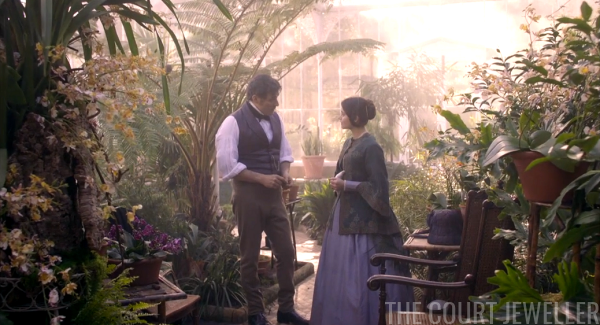 While they wait for Victoria and Melbourne to finish their conversation, Alfred and Emma have a sneaky drink in the garden. 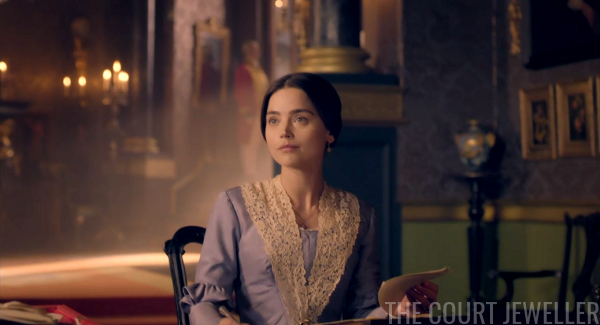 Victoria confesses to Melbourne that much of her current conflict with Albert stems from his work as substitute monarch during her pregnancy and confinement. 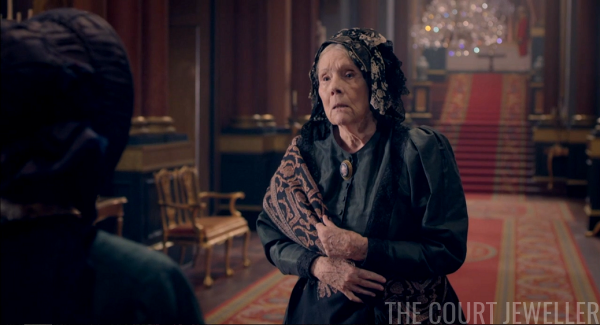 She's worried that Albert wants more children so that she can constantly be on maternity leave -- and he can basically become king. She thinks that Albert thinks he can reign better than she can. Melbourne quips that Albert wouldn't be the first man to underestimate a woman. She's the sovereign, and she shouldn't forget that. 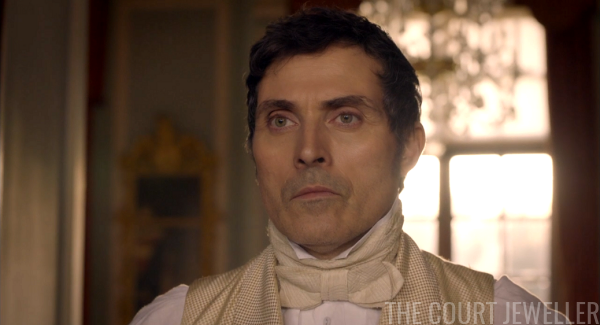 Back at the palace, Uncle Leopold -- who is still not reigning over his own country -- has heard from his palace gossip network that Victoria's expecting, and he lets Albert know. He goes in to talk with her about the baby, but she's super salty with him, reminding him that she tried to tell him last night, but he refused to come home so she could speak with him. They fight about Melbourne and Lovelace, and then she storms off. 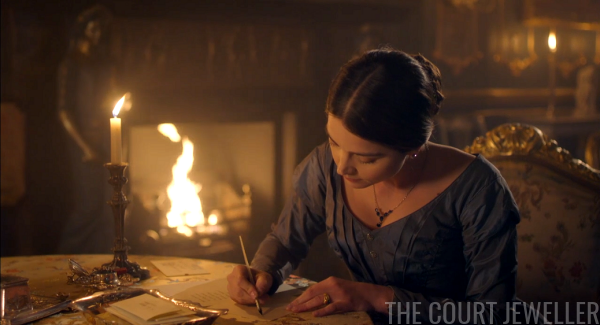 Melbourne writes to Victoria, sending his regrets -- he can't come to London right now. 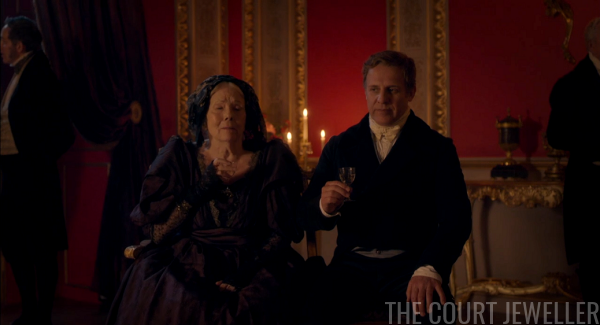 He encourages her to seek Albert's counsel, looking to the future, not the past. 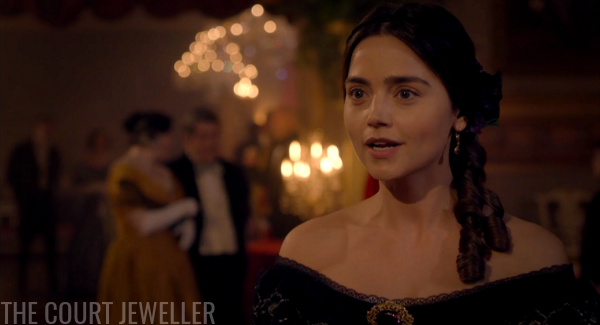 And so she does seek the future, going to meet with Lady Lovelace to see the analytical engine. But Ada has to hurry out -- one of her children has been injured. The two bond a little over the difficulties of balancing work and motherhood. Turns out Victoria isn't the only one who has sometimes wishes she'd been born male. 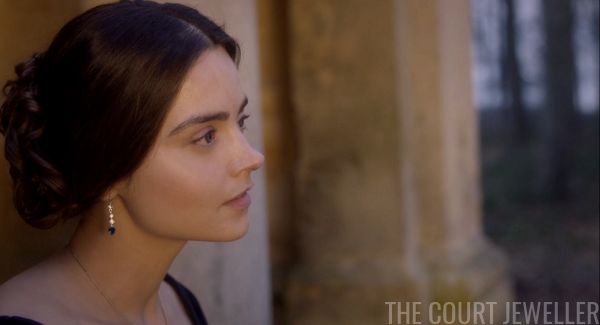 Wearing a pair of modern earrings set with white and blue gems, Victoria reminds Albert about their pre-wedding romance. 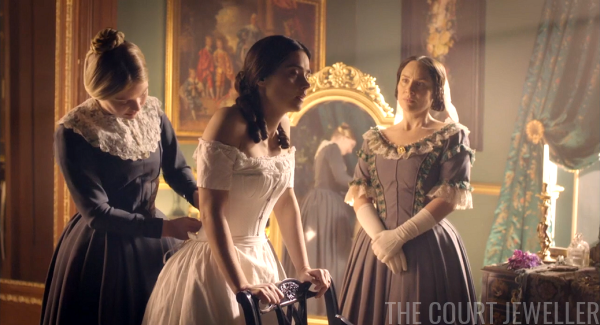 She apologizes for being jealous, and she admits that she's a little unhappy about the pregnancy, mostly because it's happening so soon after Vicky's birth. He understands, and he doesn't want her to be permanently confined. No spoilers for future episodes in the comments, please! 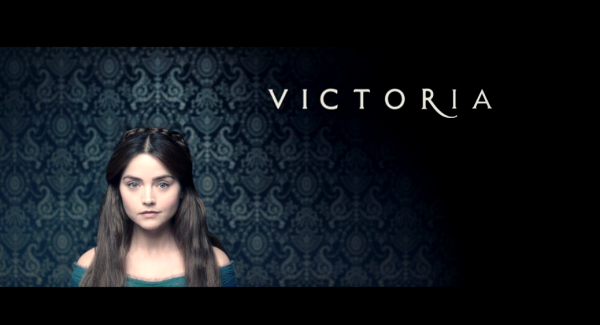 Our next recap of Victoria will be posted on Monday afternoon.